The Kylie Cosmetics Smile Lip Kit was a collaboration with a company called Smile Train which is an international children's charity providing surgery for children with cleft lips and palates. In my opinion, this is a great charity for Kylie Cosmetics to link up with and I think it's great that with her success she is giving back to the community. I would describe the shade Smile as a pale dusty pink and true to the Kylie Cosmetics Lip Kit style this is an opaque matte formula. The lip kit comes with a lip liner and a matte liquid lipstick. The liner is the game changer in the Lip Kits, being incredibly pigmented while remaining soft and buttery to apply. 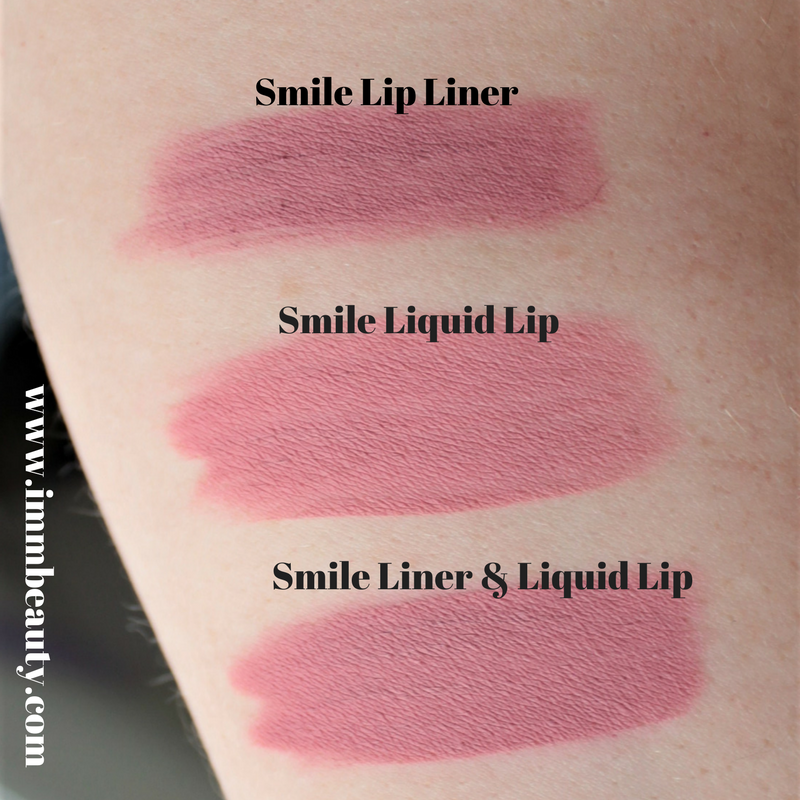 I love to use the liner under lots of different lipsticks and it definitely helps to keep my lippy on for longer than normal. Both the lip liner and the matte liquid lipstick smell really sweet. I like the scent and I find that it disappears quite quickly but those sensitive to scents may disagree. The Kylie Cosmetics Smile Lip Kit has quickly become one of my everyday favourite lip colours. I can apply this in the morning and it still looks amazing by the afternoon. I suffer from dry flaky lips a lot but as long as I use a lip scrub and my lips aren't in bad condition I can use this product and not end up a dry peeling mess. With any matte lipstick you will need to take care of your lips before and after application and I always recommend a good lip scrub and lip balm after wearing this for the day. I haven't found there to be any patchiness to this colour when I wear it and as long as I avoid eating anything oily this colour lasts the best part of the day on me which is great because I'm not one for doing touch-ups. Following on from my oily comment, you will want to use an oil cleanser or even some straight coconut oil to get this off your lips evenly when you are ready to remove it. There has been some confusion as to whether this shade is limited edition or not as all advertising for the product said that it was limited edition but Kylie Jenner personally said that it wasn't and wanted to make as much money as she could for the Smile Train charity. The shade is currently not listed on the Kylie Cosmetics website but I would keep an eye out for it as I'm certain she'll bring it back at some stage.